The Arthouse Foundation is an artist residency programme that takes place in the city of Lagos, Nigeria. With a newly renovated building in the heart of Ikoyi, the Arthouse Foundation offers residencies for two artists simultaneously throughout the year in three-month sessions. It is a newly created non-profit initiative of Arthouse Contemporary, West Africa’s leading auction house of modern and contemporary art. This call for applications is open to local and international visual artists and curators who wish to engage a new artistic project within the city of Lagos. The Arthouse Foundation provides artists live/work space and logistical support for the creation of a new artistic project, along with an intensive public programme and a final exhibition. Please note: Artists are responsible for travel and visa costs. 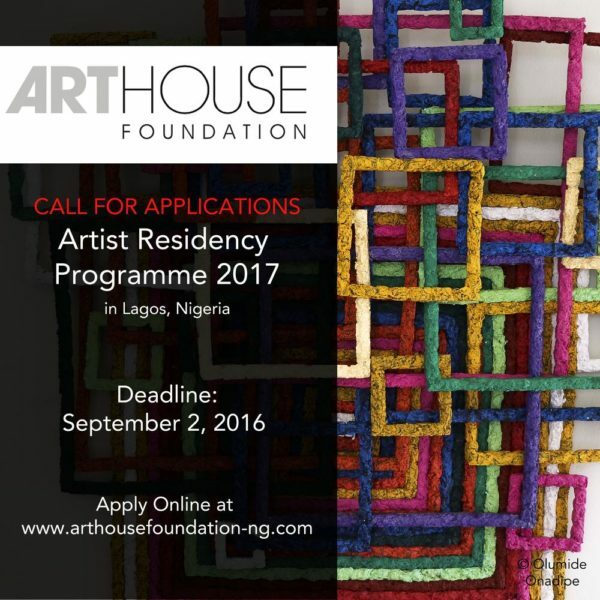 Arthouse Foundation will provide a letter of invitation for a visa for international applicants. Artist residents will donate one work of art created during the residency period to the Arthouse Foundation. For further information, please contact Joseph Gergel by email [email protected].